Ivey Wise, developed exclusively by Ivey Homes, includes features and benefits that ensure your new home is on the cutting edge of efficiency. An Ivey home employs the most progressive construction techniques while maintaining affordability and beauty. An Ivey Wise home is healthier - for you and the environment, more cost-efficient to operate, and provides comfort features to make your busy life easier. Ivey Wise homes are 100% ENERGY STAR Certified new homes which save on average 15-30% on monthly utility bills. Each Ivey Wise home is third-party rated and given a HERS Index Score that serves as the MPG for your new home. The lower the score the less you pay in energy bills! How can you tell if an Ivey Wise home can save you money? Know the HERS Index Score! Don't compromise on the features you want in a new home! An Ivey Wise home offers the Your Home Your Way program in each community and gives you the opportunity to select finishes and features making your new home truly your own. Home ownership is something you can be proud of and Ivey homes are energy efficient and beautiful by design. With an Ivey Wise home, you are creating a healthy and happy place for your family while building wealth and equity. Being part of an Ivey community you will develop lifelong friends and with an Ivey Wise home, you are supporting the environment for future generations. What factors are considered when calculating Average Annual Energy Savings? A blower-door and duct blaster test is performed on each and every new home by an independent third party to measure air flow throughout the home as well as the effectiveness of the duct sealing. Energy-efficiency is calculated based on the overall air tightness of the home, efficiency of the ducts combined with the performance characteristics of the features listed above. Can anything affect the Average Annual Energy Savings? Actual energy costs will vary depending on individual usage habits, the number of residents in the home and fluctuation in rates by your utility company. What is a Home Energy Rating System (HERS) rating? The HERS (Home Energy Rating Systems) rating provides a standardized evaluation of a home's energy efficiency and expected energy savings: the lower the HERS rating, the more energy efficient the home. The typical new code-built home has a HERS rating of 100. A home with a score of 75 would be 25% more energy-efficient than a new code-built home. The rating is calculated by an independent third party who inspects and rates each and every new Ivey home. Why does Ivey use HERS and ENERGY STAR to rate new homes? The HERS index allows comparison to new code-built homes as well as existing homes. 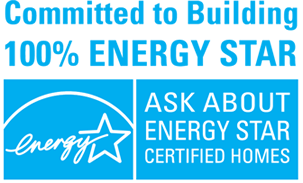 ENERGY STAR is a well-recognized nation-wide program administered by the Department of Energy that places strict requirements on the energy efficient features of the home. Part of the ENERGY STAR requirement is to have a HERS index score that is based on a variety of factors that are particular to that house and homesite. Are Ivey Wise features included in the sales price? Yes. The Ivey Wise features are considered "standard" and are included in the base price of every new Ivey home. Do any other builders offer these features or are they unique to Ivey? Some builders may offer a handful of features Ivey has included in Ivey Wise, but Ivey was the first builder in the Augusta area to go 100% ENERGY STAR and is the only builder to still build 100% ENERGY STAR Certified new homes. What is radiant barrier sheathing? Radiant barrier roof sheathing is made up of highly-reflective material and is installed in the attic. It reflects up to 97% of the sun's radiant heat, thereby lowering attic temperatures and improving energy efficiency. With traditional framing, the 3-stud outside corner space and exterior/interior wall intersections are boxed in and cannot easily be insulated, resulting in energy loss. With “Advanced Framing", a "California Corner" is a simple L-shape corner that allows easy access to install insulation in the corners and “Ladder T’s” provide a better intersection that allows for continuous insulation, reducing air flow throughout the structure resulting in greater savings on heating and cooling costs. Why is an Ivey Wise home healthier? Ivey Wise homes include low VOC (Volatile Organic Compound) paint, carpet and hardwood floor glue. VOCs react with other elements to produce ozone, which causes air pollution and a host of health issues. Air barriers and air sealing isolate living areas from fumes, contaminants or allergens that might come through the attic or walls. Explain Air barriers & Air Sealing. Air leakage is the single biggest loss of energy in a home. Ivey homes include extensive air barriers to seal gaps and block random air movement through the new home. Air sealing controls moisture, prevents dirt and pollen from leaking inside the home, and reduces air flow throughout the home, thereby increasing indoor air quality and energy efficiency. Who is the "independent third party" inspector? Ivey Homes has partnered with Sozo Energy, LLC s as its HERS Rater. In addition to rating the house, Sozo Energy, LLC provides a third party guarantee for heating and cooling energy usage.